Some animals are able to regrow tissues lost to injury or disease. Zebrafish do this in their retinas, which are remarkably similar to our own. So do humans also have these tools to repair a diseased retina? If so, what are they? All creatures with a backbone, such as humans, horses, birds, lizards and fish, have essentially the same cells in the light-sensing part of the eye, the retina. There are rods and cones, ganglion cells and glia in all of them. In fact, the vertebrate eye has been remarkably unchanged through all the innovations of evolution, such that the fish’s eye works pretty much the same as ours. The neurons and glia are arranged similarly, as are the muscles that move the eye and the chemical signals that build and operate the whole system. “Although fish and humans share similar gene expression programs for retinal development and function, there are differences,” says Dan Goldman, Ph.D., the Bernard W. Agranoff Collegiate Professor of Neuroscience, research professor at the Molecular and Behavioral Neuroscience Institute and interim chair of biological chemistry. 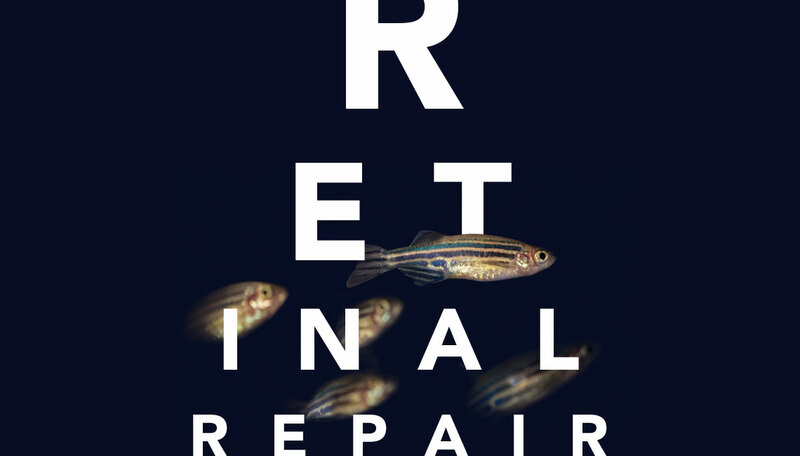 The most notable difference is that the zebrafish can regrow a damaged portion of its retina and reconnect its neurons to the brain in just days to weeks, and visual function is restored as if nothing had happened. Rajesh Rao, M.D., Alon Kahana, M.D., Ph.D., and Peter Hitchcock, Ph.D.
Goldman and W.K. Kellogg Eye Center researchers looking for answers to diseases of the eye like macular degeneration, retinitis pigmentosa and retinopathy would like to figure out how the fish does this. Do we still have all the pieces of that machinery and merely need to turn them back on, or have parts of the process been lost? Could we re-awaken or re-install the missing pieces in our own eyes with the newest gene-editing tools? To fix it, of course, we first have to understand it. In a glowing microscopy sample of the retina, one cell in this layered and highly organized structure stands out as obvious and huge. Its name is the Müller glia, and it spans the entire thickness of the retina, from the photoreceptor layer that detects light in the outer portion of the retina to the ganglion cells in the inner portion, which bundle electric signals through the optic nerve to the brain beyond. Covered in branching “processes” that reach around the other, much smaller cells, Müller glia look very much like towering trees, says Kellogg researcher Peter Hitchcock, Ph.D., a professor of ophthalmology and visual sciences, and of cell and developmental biology. Viewed from above, they form a forest, “a palisade of cells,” he says. Glial cells of the nervous system like the Müller cells were long thought to be simple help-mates of the more charismatic neurons. But advances in molecular and cellular biology have shown glia throughout the nervous system to be much more important than that. They are protectors, promoters and pruners, feeders and signalers. Most impressive of all, Müller glia in the zebrafish can execute a complex program to manufacture new neurons when they sense the retina has been damaged. Goldman’s fish room houses tall metal racks of Lucite tanks, each labeled with colorful tape to indicate what kind of fish it holds and sparkling from within as the legions of tiny fish move about. There are thousands of research animals here in row after row of tanks, and the sound of running water gives the room a tranquil quality. The particular fish being studied in the Goldman Lab in the A. Alfred Taubman Biomedical Science Research Building, by researchers at the W.K. Kellogg Eye Center and in many other corners of the U-M campus is Danio rerio, the zebrafish. It’s just like the one sold as a “Zebra Danio” at the pet shop, with maybe a few genetic alterations. Three days after a zebrafish egg is fertilized, the transparent embryos are complete, semi-transparent little fish with heart, brain, spine, nerves, blood, muscle and retinas in place. As the fish grow larger, stem cells in every tissue crank out new parts — more bone, longer blood vessels, a bigger brain and a wider retina. In 1998, Goldman’s lab was studying tubulin gene expression in the fish’s central nervous system. His team realized that the tubulin promoter may be a good reporter of cell regeneration and created a transgenic fish in which green fluorescence marked the development of the fish’s central nervous system. Fish are also uniquely useful because they swim in and breathe water, says Alon Kahana, M.D., Ph.D., an ophthalmic surgeon at Kellogg who studies muscle regeneration and cancer in the fish. Administering an experimental dose of medication can be as simple as putting the drug into the tank. Not using restraints or IV needles also means no stress for the organism. “When we find a process that’s important to human health, we can use the fish to develop drugs,” Kahana says. For all these reasons, zebrafish are becoming a mainstay of the emerging science of regenerative medicine — a bold attempt to reawaken or restore ancient self-repair mechanisms and bestow humans with the ability to repair their own tissues. Hitchcock and Goldman are selectively killing neurons in the fish retina and then watching the cascade of chemical responses to spot the signals that are telling the cells how and when to respond. “We’ve basically gone in and altered all types of retinal cells together and separately, and we get the same response,” Goldman says. The Müller glia around the injury reprogram themselves and get to work making replacement parts. When they sense an injury to the retina, Müller glia change their shape, biochemistry and physiology and open a toolbox of special repair genes. The process spawns a small population of stem cells that can become all six types of retinal neurons. The immediate first step is for the glial cell to swell up, a state called hypertrophy. Next, the glia “reprograms” itself. In the cell nucleus, where genes are stored, it accesses parts of the genetic library that have been silenced. These are genes normally used early during embryonic and retinal development. “The same genes exist in our genome,” Goldman says. Dan Goldman, Ph.D. (left) and Josh Kirk stand amid the rows and rows of zebrafish tanks in the Goldman Lab. The progenitor cell stays close to the glia’s trunk and begins dividing itself, making six or eight new multi-potent stem cells that also stay close to the trunk and use it to move up and down in the retina. These progenitors are capable of differentiating into any of the six dramatically different kinds of retinal neurons. In fact, regardless of what cells are needed for a specific injury, the process will make all six kinds of neurons, Goldman says. They aren’t sure why this is yet, nor what happens to all those neurons if they aren’t necessary for the repair at hand. “Maybe only those that are needed get wired up to the system and survive, and the others die,” Goldman says. Or maybe all six kinds are put to use rejuvenating the cell populations around the injury, and it’s the older cells that are replaced. “And maybe that would be a way to keep the retina young,” Goldman says. For now, at least, there is something different that keeps us from regenerating the way the fish do. “I strongly believe that we have evolved to block the de-differentiation process,” a cell’s ability to run its programs backward to become more like a stem cell, as the Müller glia does, says Kahana, who also operates on the minuscule eyes of zebrafish to study regeneration. His current focus isn’t on the retina, but rather on the set of six muscles that control the movement of the eye — the same six muscles humans have, with the same nerve circuitry. With tiny scissors, Kahana clips about half of a fish’s lateral rectus muscle out, the muscle being only two millimeters long by a half-millimeter wide to begin with. “We’re ophthalmologists, so we’re good microsurgeons.” The clipped muscles will swiftly pump out replacement cells and grow back, connecting their severed ends within five to seven days. After a week to 10 days, the muscle functions again. Perhaps even more impressively, Kahana says they can cut the muscle again in a month, and the month after that and the month after that, and it will always grow back. There are no stem cells in this system, only muscle cells that know how to “run backwards” to make more cells when needed. Like the retinal researchers, Kahana is looking for pieces of the multi-step program that senses and responds to injury with such remarkable precision. When researchers can see the regeneration signaling pathway in full, Hitchcock expects it to be spectacularly complex and exquisitely balanced, like the blood-clotting response and other finely tuned physiology. The recipe’s parts are probably myriad, and checks and balances are key, because there’s a very fine line between building healthy replacement cells and roaring off into a cancerous growth. So far, these researchers have found many pieces of the code and are even capable of making regeneration happen with a signal they deliver. “We’ve identified a number of molecules, any combination of which are sufficient to trigger the regenerative program of the zebrafish Müller glia,” Goldman says. Many of these molecules have been introduced into the mammalian eye without stimulating retina regeneration. However, recent studies at several labs around the country suggest that two key regenerative genes in the zebrafish retina can stimulate a small amount of Müller glia proliferation in mice. These are just the beginnings of translating the zebrafish work to mammals, and, although some important parts of the code are still missing, Goldman and Hitchcock hope to find them. Each new piece of the puzzle is a hard-won scientific victory, sometimes years in the making. But the researchers say they’re making important progress. For Goldman, the journey in fish started with reporting on the regeneration of nervous system cells using green fluorescent protein. When his team labeled injured retinal cells with the green signal, expecting to find precursor stem cells everyone was sure had to be there, they found Müller glia hiding in plain sight. “Although the zebrafish Müller glia wasn’t originally considered a stem cell, there were reports of Müller glia proliferation in fish and postnatal chick retinas,” Goldman says. In addition to all its other vital roles, the glia seems to retain some stem cell capacity that allows it to respond to retinal injury and the loss of neurons by proliferating and generating cells for retinal repair. Rajesh Rao, M.D. — assistant professor of ophthalmology and visual sciences at the W.K. Kellogg Eye Center, and of pathology, and the Leslie H. and Abigail S. Wexner Emerging Scholar at the A. Alfred Taubman Medical Research Institute — is taking what has been learned so far in zebrafish and trying to directly reprogram skin cells into retinal cells. He would like to convert, in a single step, easily isolated cells into retinal cells. Success would mean better ways to model retinal disease or produce new transplants entirely in a dish. Currently, he’s using skin cells from a mouse whose retina glows green due to a fluorescent reporter linked to a retinal gene. By introducing genes known to promote development and regeneration in fish, as well as other animals, he looks for the fluorescent green color to form, which signifies that skin cells have converted to retinal cells. While this work is still in progress, he has managed to convert skin cells into partially converted retinal-like precursor cells. Rao also is making lines of pluripotent stem cells in which different fluorescent colors are attached to specific retinal genes. This allows his team to watch the timing and sequence of gene activity in 3-D retinal “organoids” that form from stem cells. In these new stem cell lines, his team will be testing libraries of molecules that may coax stem cells to selectively produce more rods or cones. Rao says he would love to coax a human’s skin cells into becoming replacement retinal cells through direct reprogramming. The ultimate “home run,” however, would be to signal the human retina to repair itself from within, just as the zebrafish does. Read more about the Zebrafish research being conducted at the W.K. Kellogg Eye Center — including in the lab of Breda Bohnsack, M.D., Ph.D., whose research could lead to breakthroughs in genetic testing and therapeutic approaches to prevent blindness in children affected by congenital diseases.